Incomplete dominance refers to a genetic situation in which one allele does not completely dominate another allele, and therefore results in a new phenotype. 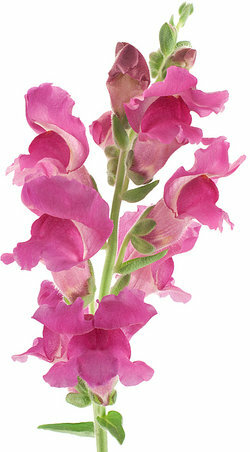 A snapdragon flower that is pink as a result of cross-pollination between a red flower and a white flower when neither the white or the red alleles are dominant. A brown fur coat on a rabbit as a result of one rabbit's red allele and one rabbit's white allele not dominating. A child with wavy hair as a result of one parent's curly hair and the other's straight hair. An Andalusian foul produced from a black and a white parent is blue. A carnation that is pink that is a result of cross-pollination between a red carnation and a white carnation. A black dog and a brown dog mate and the result is a dog with a brindle coat. A white cat and a brown cat mate and the result is an orange cat. A tall horse and short horse mate and the offspring is off medium stature. A big American Bulldog and a small American Bulldog mate and their offspring is medium-sized. A long tailed dog and a short tailed dog mate and the offspring has a medium lengthened tail. A blue bird and a red bird mate and the resulting offspring have mixed colors. A light-skinned person and a dark skinned person produce a child with a skin color that is in between each. A brown rat and a white rat mate and create a rat with a mixed color coat. A short-haired dog and a long-haired dog mate and the resulting offspring have medium length hair. Tay-Sachs disease is an example of the result of incomplete dominance because the gene that makes the antibodies only creates half of the necessary antibodies which creates a vulnerability in the individual to get Tay-Sachs. One parent has a large lip protrusion, the other parent has a small lip protrusion and the child has an average lip protrusion. One parent has a high voice, the other parent has a low-pitched voice, so the child has a voice of medium pitch. Sickle cell disease is the result of incomplete dominance as those who have the disease carry 50% normal and 50% abnomal hemoglobin. If a red tulip and a white tulip are cross pollinated they result is a pink tulip. A highly spotted cat and a cat without spots has an offspring that has only some spots. A person with big hands and a person with small hands have offspring with hands of average size. A red bird and a blue bird mate and their offspring are purple. A brindle dog and a white dog mate and the offspring are a mix of white and brindle. A dog with eye patches and dog without eye patches breed and produce offspring with one eyepatch. Incomplete dominance helps to account for some of the variations that make nature so amazing and that make people and animals unique. "Examples of Incomplete Dominance." YourDictionary, n.d. Web. 23 April 2019. <https://examples.yourdictionary.com/examples-of-incomplete-dominance.html>.